This week we are doing a trial with a Quickie Kid Kart push chair. 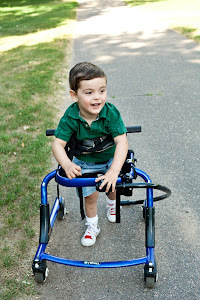 It is a special needs stroller that provides a lot more support than a typical stroller. More importantly, it has bus tie-down ability for the Fall when Roa rides to school. Last week we tried the Ottobock, and were not happy with it's overkill support and large size. This Quickie is average size, as special needs strollers go and has head support and trunk laterals that work well for Roa. We struggle with the idea of purchasing on of these push chairs for many reasons. one, it is hard to enter this world of "wheelchair" contraptions when you wish so desparately hard that Roa will walk. Two, it is not exactly a "therapy chair", as the description implies. There is no work when strapped and belted and fully supported. Three, we don't want smart little Rojo to figure out that this is easy....just push me around. And lastly, silly as this sounds, the new push chair idea will be the complete and utter Cerebral Palsy red flag. As I used it yesterday, going into Functional Kids for therapy, I was very conscience of the looks we got from others. We no longer can disguise the lack of motor control with a regular stroller. This chair screams...yep. I have CP. Silly. I know. The kid walks with a gait trainer, wears AFOs...it's one more thing. But just another step in the grief cycle. And one more thing to add to the costly list while traveling through CPland. Roa had his third birthday on Friday! I cannot believe my boy is 3! I took the day in with both joy and sadness. I feel like I have aged about 10 years in these past 3! You never dream on the day you give birth to your new little life that at age three, he would only have slept through the night a handful of times, that he would not be self feeding or dressing, or sitting on his own. That you would be looking at pushchairs, walkers, and assistive seating. I watch Gunnar grow, 7 1/2 months now, and see how development is fun! Full of exploring with his hands, feet, and mouth. I see him move into tripod stance with such ease and bear weight on his arms. Amazing! He is starting to eat soft chunks of fruits and he doesn't gag! He is smiley and giggly, as every baby should be. Roa was not so fortunate in his babyhood. He cried more than he smiled. He felt discomfort more than he felt joy. It is those memories that make me so melancholy. Motherhood was so stressful and sad with Baby Roa. Motherhood with Baby Gunnar is amazing! As a parent, you want THE WORLD for your child! When he struggles throught it, you search for answers of how to heal his pain. 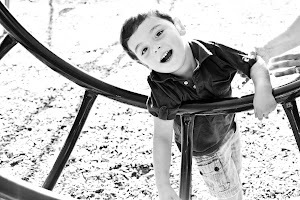 Until cerebral palsy has a cure... until Roa is able to tell us what works for him to help bring independence and joy,... we will keep searching. We budget, we save, we forego family vacations and extra "things" for ourselves to pay for equipment, toys, aides, therapies, vitamins,... that just might work for Roa... and sometimes they don't. We thank you, family and friends that celebrated Roa's birthday through gifts of money or toys that just might work for Roa. We thank you even more for the support that you might have given us through the past three years. Roa is stronger because of you lifting us up along with him. EVERY DAY is a test in strength and faith for those of us who struggle with a disability. EVERY DAY is a new lesson in grief for what might have been. EVERY DAY our hearts yearn for an answer. a cure. some grace from above. DO NOT FORGET about us and our daily struggle. BE our shoulder to lean on. Our voice in prayer when we are discouraged. Be our hope and our faith when we cry out for answers. We need you still today. Three years later. We still fight. Botox is complete again. Round four. It was very strange as we decided to have Gunnar and remain at home while Dad took Roa in for the treatment. It was very difficult for me to not be there- ready to give him a big hug and snuggle after the session. Bryan said he did fine. Cried more than the last sessions, but had a long wait with an empty tummy beforehand, making it more irritating to the King. As usual, Bryan cohersed the nurses assisting to break into a chorus of kids sons to help Roa remain calm. Always a hoot to hear about! Bryan and Roa went swimming this morning and Roa is already showing some side effects from the injections, especially in the adductor area which will help in floor sitting. Now is our time to stretch and strengthen while the botox is in full affect. Thursday was our last Birth to 2 session with Laurie and Mary. We are so sad to have these wonderful ladies exiting our lives, but Roa is growing and changing and on to new adventures with new teachers and therapists. by Mommies of Miracles on Tuesday, June 14, 2011 at 8:25am. Remember that he is, first of all, my child. and not about how delayed that smile was in coming. I know that you care for my child and that you work hard with him. I need your expertise to help him become all that he is capable of being. You need my help in understanding who he really is and in following through at home with things that are important. Remember, though, that you send him home at night and have weekends off and paid vacations. sometimes just emotionally, for a day, a week, a month, without your judging me. I will be there for him when you are long gone. I love my child with an intensity that you can only imagine. If on a given day I am tired or cross with him, listen to me, lighten my burden, but do not judge me. but forgive me if from time to time I shed a tear for who he might have been. Roa loves hiking in his backpack carrier with Daddy. It's getting to be a workout for Daddy, but he is up to the challenge! Well rewarded with a giggling rider! As I sit down to do a little much needed blogging, I feel little eyes wtching me from the swing. Gunnar is awake. Much like his big brother, gunnar is a mini-napper, sleeping for 30 minutes- 3 times a day. 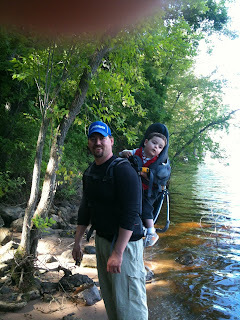 Roa is off to Conductive Ed with Brittany, but my "time-off" isn't like it used to be since Gunnar came into our world. Gunnar is a miracle. We marvel at all his accomplishments and watch with wonder as he sits, uses his hands, eats without gagging. He has now started to pivot and move backward on his tummy. He even is pulling to stand. Having another child was scary after our struggles with Roa, but I am so happy we did. Roa loves watching his brother. He wants to see everything Gunnar is doing. We are happy to report that Roa is pretty motivated to play on the floor now with his brother. We are working on that darn sitting with independence. UGGHHHh! The day Roa sits on his own for longer than 3 minutes( which is his current record) I will do kartwheels across the lawn!! I promise! Gunnar and Roa have a secret joke going on at all times. Looking at each other and laughing.... it melts my heart. *****Okay, so it is a week later since I started that post. Having these active kids is hard on a blogger! Roa is off to day one of his summer session of Conductive Ed. Grandma Lenore was kind enough to drive him as Brittany is off frolicking with Mickey and the Gang in Florida. So, I will take this time to blog and ignore the dust bunnies fighting over the Gerber puffs tucked under our table legs. Roa has a busy summer planned therapy-wise. Tomorrow is our very last Birth to 2 session and I am so sad!!!! I can't believe that these wonderful ladies will not be visiting us anymore at the Thayer home! It is hard to imagine Roa growing and changing without them! Roa will be going 2 days a week to Conductive Ed, Speech combined with OT 2 days as well, Music therapy 1 time, aquatic on our own 2 times. We will try to fit a few craniosacral session in as well. Oh, and hippotherapy/horseback riding starts after his birthday. Our little Roa is turning 3 on June 24th. So hard to believe. He is getting so tall. I wish I could put in a wish to God to keep him small for just a bit longer until he gains more stability! We bought him a new Child Rite seat- similar to a Bumbo, but made for larger children with special needs. It helps with floor time, but he really wants to be down on the ground with his brother. On Friday, Roa is recieving his 4th Botox injection series. That too, will help with sitting and hopefully will aid with his continue practice with his reverse walker. We like his gait trainer, but the reverse walker gives him more freedom. Okay, so update complete! Off I go to conquer the housework before G-man wakes up from his power nap!